Christian theology is the study of God by the reading and interpretation of the Bible (revealed theology) and scientific or philosophical investigations into the universe, nature and biological systems (natural theology). Christians and churches formulate beliefs from Scripture, but both revealed and natural theology concern themselves with systematizing a coherent case for Biblical Christianity allowing the core doctrines to be explained and defended. Historical theology concerns the study of the interpretation and application of Scripture by Christians and churches of the past. Theology in the general sense of the term attempts to understand the nature, characteristics, and attributes of the divine, be it one god (monotheism) or many gods (polytheism). The English word theology is derived from the Greek word theologia (θεολογία), theos (θεός) meaning god and logos (λόγος) meaning reasoning or logic. Paul teaches natural theology within Romans 1. Because natural theology being taught by Paul is found within an authoritative text from which revealed theology would gain its understanding, it can be interpreted that both are acceptable in forming Christian theology so that reason may be found within faith. Within the modern history of Christian theology there have been and continue to be numerous challenges, but atheism in public discourse and debate is seemingly the new trend. Atheism essentially maintains a militant antagonist relationship with Christian theology whenever the discussion and ideas are presented. Darwinian evolution and especially theistic evolution is taking on more credibility in the secular academic setting. Whole campaigns of misinformation have also begun by major institutions and names like Richard Dawkins to essentially misrepresent the stances of both Intelligent Design and Creationism. The New Atheists as they are called have set the tone that media and establishment types continue, that denies separating and drawing conclusions properly from different realms of epistemology (either revealed or natural theology). Many fail to ever grasp the distinction and then go about labeling inferences of natural theology like Intelligent Design as merely a dressed up form of revealed theology (creationism). Revealed theology can also be called biblical theology and is Christian theology founded in the Bible by presupposing its authority. Under a historical-critical exegesis underpinned by a systematic methodology verses are found throughout the Old Testament and New Testament of the Bible that contain similar and consistent teachings about the nature of God and His revelation to humanity. Jesus Christ is the central figure that guides revealed theology within Christianity by presupposing His life, death and resurrection as the fulfillment of prophecy. It is in this light that exegesis proceeds and allows the practice of sound hermeneutics. Natural theology is a realm of Christian theology that expounds on beliefs about the nature of God by nature through excluding divine revelation in holy scriptures as authoritative for theology. Appeal to the authoritative truth from the Bible is called revealed Christian theology and it forms theological doctrines about the nature of God on completely different sets of criteria. This is achieved by exegesis of verses found in the Old Testament and New Testament and deep investigations into the background of the authors. Alternatively natural theology bases itself within the realm of science and philosophy. The natural world is given epistemological authority as a way to know theology. The assumption is that the human mind is rational and able to know and understand nature, but because nature has been created by a rational creator. Philosophical argumentation and scientific evidences are the means by which natural theology is articulated and systematized. Not to falsify specific theories as such but to probe the nature of nature. To show logically that inference to transcendent cause over matter is the necessary being God. Liberal theology practices an entirely different set of philosophical axioms to inform its religious movement and attempts to reinterpret established doctrines of Christianity. According to the Merriam-Webster dictionary the word doctrine is defined as, "a principle or position or the body of principles in a branch of knowledge or system of belief." Christian doctrine is the body of principles which inform Christian theology, or what is the exploration of the nature of God by Christians since its founding by Jesus Christ in the first century AD. A biblical canon is a collection of books that is accepted as authoritative Scripture within a Christian or Hebrew group. While the canon (from the Greek word kanon, meaning a measuring rule or standard) that is used by a particular group can vary considerably, this article is primarily concerned with the Protestant Canon, the Canon espoused by CreationWiki. The typical Protestant Canon contains 66 books (though two of the books, Esther and Revelation, are sometimes given a quasi-Canonical status) written by at least 43 different authors over a period of 1500 years (from Moses to John the Apostle). Biblical inerrancy is a belief and a doctrinal stand that the Bible, both the Old Testament and New Testament is without error. Such belief or trust in the truths of the Bible weigh heavily into Christian epistemology, and ultimately faith in salvation. 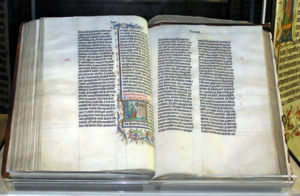 Although some point to alleged contradictions, biblical inerrancy is a position held because external evidences can be found in many forms; extra biblical attestation, prophetic prediction and fulfillment, scientific foreknowledge before the exact science was known, and verification by archaeology. A similar but contrasting view known as substantive accuracy holds that the Bible is accurate, but not wholly inerrant. It is believed that the scriptures were written by wise and intelligent men who either observed the things they recorded, or based their accounts on reliable and accurate sources. A Latin Bible handwritten in 1407 AD. Hermeneutics is the science or practice of understanding text (theory of interpretation). Although there are secular applications, the term was used originally to stand for the field of biblical interpretation. The philosophy or methodology assumes the Bible remains as written, but that its interpretation changes between historical periods, across cultures, etc. It is a qualitative research tradition that uses these diverse experiences of people as a tool for understanding the social, cultural, political, and the overall historical context in which interpretations occur. 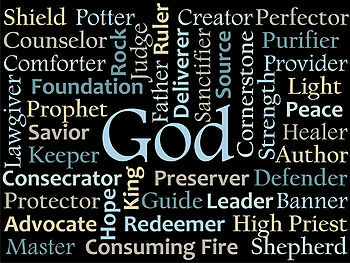 Various name of God as described in the Bible. God has many names and titles, most notably Yahweh or Jehovah (Hebrew: יהוה, Yāhwēh; Greek: Ἰαουέ, Iaouē; Latin: Iahveh) in Christianity, Lord (Hebrew: אֲדֹנָי, ʼAḏōnāy) in Judaism, and Allah (Arabic: الله, Allāh) in Islam. Most theists hold that God is perfect, omnipotent, omniscient, and benevolent. Questions regarding the existence and nature of God falls under the branch of philosophy known as metaphysics. There are dozens of arguments for the existence of God that have been put forth by philosophers and theologians for thousands of years. Usually in discussions, debates and apologetic materials for Christian theism there are five such rational arguments for the existence of God. These arguments have gone through popular treatments and technical analyses by many prominent philosophers and believers such as William Lane Craig, Charles Taliaferro, Richard Swinburne and Alvin Plantinga. The arguments are considered positive for the case of Christian theism specifically and that must have their premises refuted through positive arguments for the atheist or agnostic case for belief. The arguments for the existence of God can be used by Christians and theists alike to build a cumulative case for the existence of a transcendent, timeless, spaceless, personal creator of the universe. Being logically sound the conclusion that God exists must necessarily follow from the premises. The trinity is a specifically Christian ontology of God. The word originates from the Latin Trinitas, meaning "threeness." A wholly unique variety of theism that is strikingly different from Islamic and Jewish Unitarianism. Trinitarianism holds that God is revealed in three unique persons. Although unique they do have relationship and within the biblical text are referred to metaphorically as; Father, Son (namely Jesus Christ) and Holy Spirit. Each personal nature of God is with independent purpose and dependent relationship with the other, all united within, what is sometimes referred to by theologians as the Godhead. Humans or human beings are any of the species or races within the genus Homo. The Biblical worldview of humans is governed by the doctrine or belief that humans were created in the image of God and consist of a physical body and an immortal soul. This view is philosophically opposed to evolutionism or traducianism. The human body is the physical or biological component of the human being. Humans are arguably the most complex organism on Earth. Billions of microscopic parts, each with its own identity, work together in an organized manner for the benefit of the total being. Such is the body that God has created for us. In Psalm 139, David declares his body is wonderful evidence of God's creative love. Its wonderful design serves to provide evidence of God's creative power and the love He has for us. Agony in Gethsemane by Heinrich Hofmann. 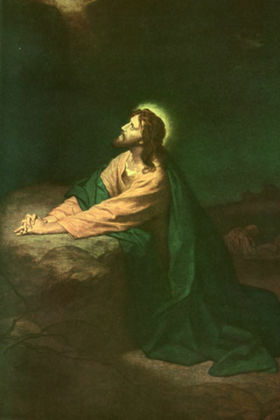 Jesus Christ or Jesus of Nazareth (Hebrew: יהושע, Yehōshūaʻ; Aramaic: ישוע, Yēshūaʻ; Greek: Ίησους, Iēsous; Latin: Iesus; "Name means::YHWH is Salvation") is the Hebrew Messiah and the physical incarnation of God—the Son of God (meaning that he is God the Son, the Second Person of the Holy Trinity, of the same essence of and co-eternal with God the Father and God the Holy Spirit, but distinct in Person). He came to earth as a man, yet being both fully Man and fully God, to provide salvation and reconciliation by His death for the sins of mankind. He was born in the reign of Augustus Caesar (about Born::5 BC) in Bethlehem, Judea to the virgin Mary and was raised in Nazareth in Galilee by his mother and foster-father, Joseph, whom He followed in becoming a carpenter. He was executed by crucifixion in about Died::April 34 AD, after condemnation by Pontius Pilate, the fifth procurator of Judea. Through Jesus' incarnation, life, death and resurrection within history, He began what is now the largest religion in the world, Christianity. “ Two thousand years have come and gone, but still his remains the unfinished story that refuses to go away. Jesus of Nazareth, a Jew from rural first-century Galilee, is without doubt the most famous and most influential human being who ever walked the face of the earth. The followers of Jesus live in every country of the globe. They read and speak of him in a thousand tongues. For them, the world’s creation and destiny hold together in him, the wholly human and visible icon of the wholly transcendent and invisible God. He animates their cultures, creeds and aspirations. 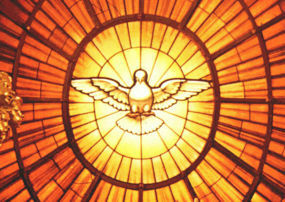 The Holy Spirit depicted as a dove in the stained glass window behind the Cathedra Petri in St. Peter's Basilica, Rome. The Holy Spirit (Hebrew: רוח הקודש, Rūakh HaQōdesh; Greek: Άγιον Πνεύμα, Agion Pneuma; Latin: Spiritus Sanctus; also called the Holy Ghost) is the Third consubstantial Person of the Holy Trinity or the Godhead, in Christian religions which trace their roots to belief in Christ and abide by the Nicene Creed. The earliest Christian church is in the third-century at Dura Europos, near the Euphrates river. It was a house that was remodeled as a church, but destroyed by Sassanians around 256 AD. There are several different definitions within the wider public regarding what church actually means. A place of worship, and more specifically a place of Christian worship. A building to house a Christian religious service. A corporate organization that concerns itself with the staffing of places of worship, the training of pastoral or other staff, and the discipleship of lay worshipers. The entire body of Christ, the definition given in the Bible. ↑ Charles H.H. Scobie, “New Directions in Biblical Theology,” Themelios 17.2 (January/February 1992): 4-8. ↑ Has Science buried God? The quote is: "I believe the Universe is rationally intelligible precisely because there is a Creator-God behind it. How do you account for the rational intelligibility of the Universe? " This page was last modified on 18 June 2017, at 21:58.